Motors which are centrally mounted at the bottom bracket are referred to as Mid-Drive, Crank-drive or Mid-Mount Motors. The motor is effectively turning the front chain-ring, which turns the chain and then the wheel, pushing the bike along. This system works in conjunction with the gears on the bike, so when different gears are selected, the motor gives a different level of performance. Just like a car with a manual gearbox, low gears are for high torque (for take-offs and hill climbing), and higher gears give higher speeds. Therefore, the performance of mid-drive systems are broader in their scope than hub motors of the equivalent power output. Geared hub motors, such as those in our 250w and 500w Hub Kits, are great simple systems for lower power levels, as the Planetary Gear System within the motor helps you get better low-down torque (for acceleration and hill climbing) from a lower output motor. 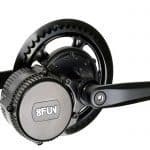 The gears inside are made from a nylon composite material, to allow them to be durable and quiet. The main benefit of the geared motor is total freewheel ability (so, zero rolling resistance), meaning you can pedal the bike easily if you are not using the battery. They are also much less obvious than the larger Direct Drive electric bike motors, and weigh considerably less. Geared hub motors are independent of the bike’s gears, meaning they are easy to use, with the selected gear bearing no influence on the performance of the motor. The 1000w+ hub motors are Direct-Drive, brushless, gearless DC ‘pancake’ motors. Direct Drive motors are used for higher power applications, as the nylon gears used (for quietness) in geared motors would not survive long at these higher power levels. Unfortunately this means they do not totally freewheel – they will spin less times than a normal bike wheel once you stop accelerating or pedalling. However, the magnetic nature of Direct Drive motors allows Regen Braking, meaning the system can capture some energy during braking or deceleration, and push it back into the battery (see below). 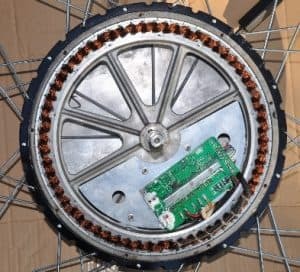 This type of motor is best for those who aren’t really looking for any exercise when riding their e-bike, so for those who don’t want to pedal. Hub motors are independent of the bike’s gears, meaning they are easy to use, with the selected gear bearing no influence on the performance of the motor. We don’t any longer offer these Direct Drive motors as standard options, but can source 500w-1000w direct drive motors for fitting into front wheel dropouts. These are a common solution for delta (single wheel at the front) upright tricycles. (DIRECT DRIVE MOTORS ONLY) When your bike is going downhill beyond the motor’s top speed, or you apply the brakes (presuming you’ve fitted the supplied brake levers with electrical signal coming out), direct drive motors will provide regen braking to assist you to slow down. The system reverses the current flow of the motor and converts your kinetic energy back into electricity, which feeds back into your battery. In addition to the benefit of assisting you to slow down, this helps you charge your battery whilst out and about (maximum 5% increase in range). The controller limits the current going into the battery to safe levels for the battery, so much of this energy is lost as heat through the controller. When using the regen braking, beware that you should not hold it on for prolonged periods, as it can overheat the controller if overdone. If the battery is already fully charged, avoid using the regen brakes, and try to avoid switching straight to full throttle after using regen down a hill. The controller is an important part of an e-bike kit. It manages the requirements of the different system components, and has some safety features built in (i.e., low-voltage cutouts to protect your battery when running flat). Hub motor systems have external controllers, which are normally housed in bags supplied with our kits, with excess cabling and plugs stashed inside too, and mounted somewhere on the the bike (in the triangle or under the seat normally). Some batteries include a controller box at the front of the battery. 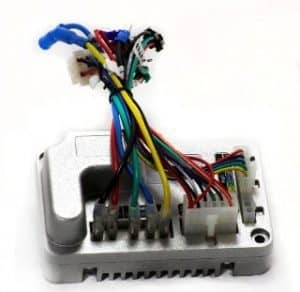 This means it’s a simple replacement if the controller fails, and you also have somewhere to stash any excess cabling from your kit. Controllers are internal (located within the motor) in our mid-mount systems. These are Programmable controllers, which can be plugged into our computer via USB to set various motor control parameters. We also sell external ‘Magic’ Controllers, which are multi-voltage programmable controllers, that can run virtually any e-bike motor up to 1000w (continuous output = 30amp, peak output = 60amp). Plug changes may be required to run with other motors, but they do work for most motors. These Magic controllers can be purchased with plug-compatible handlebar controls – call us if you require a complete set, or, we can fit plugs to match your existing setup if required.